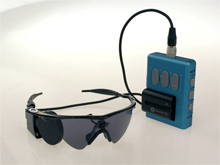 Second Sight’s Argus II, the first retinal prosthesis has received European approval for clinical and commercial use, with FDA approval expected in 2012. The $115,000 device uses a camera mounted on a pair of glasses to capture images, and corresponding signals are fed wirelessly to a chip implanted near the retina. These signals are sent to an array of implanted electrodes that stimulate retinal cells, producing light in the patient’s field of view. it can restore partial vision.